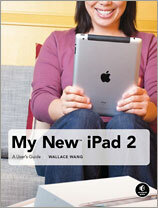 In getting up to speed with using the iPad 2 that I purchased a couple of months ago, I've found Wallace Wang's new My New iPad 2: A User's Guide a valuable orientation manual. I skipped the original iPad, and iPhones don't work here except as WiFi Internet devices, so using the iOS was new to me. It's one thing to casually play with someone else's machine for minutes at a time (my daughter, who lives elsewhere, has one), something else entirely to live (and at least try to) work with the iOS on a day to day basis. My New iPad 2: A User's Guide, a review copy of which by coincidence arrived here almost simultaneously with my iPad 2, proved to be exactly what I needed to get up and running quickly and efficiently, and to help avoid slowdowns and pitfalls that would have been inevitable had I tried to bootstrap the orientation using just Apple's pathetic hard copy documentation, which amounts to a handful of tiny, sketchy loose-leaf notes. (Apple does offer free downloadable user manuals in PDF format, including a very decent iPad 2 User Guide for iOS 4.3 Software and many other titles. However, I prefer a real, ink-on-paper books for device manuals. 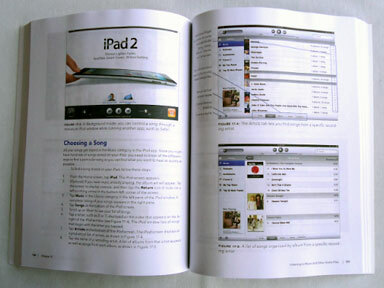 Updated for the iPad 2 and now in full color, My New iPad 2 (No Starch Press, May 2011, 280 pp., $24.95, 4C, ISBN 9781593273866) explains how to use new features introduced in iOS 4.3, as well as the features like iPad 2's new front- and rear-facing cameras, its multitasking (not really) capabilities, and FaceTime video-calling. My preference whenever I land a new device - be it a computer, a lawn mower, an electric drill, or a toaster-oven - is to "Read The Fine Manual." Interestingly, the new electric lawn mower and keyless chuck 3/8" drill I unboxed around the same time as the iPad, despite being commonplace and minimally complex machines, both came with actual hardcopy manuals that put Apple's iPad hardcopy documentation to shame. This is why books like My New iPad 2 are necessary. The book is intended to guide the user through the processes of setting up and running the iPad 2 for either personal or business use, or both. It's not a narrative that you would want to read from front to back unless you're an owners manual enthusiast, but rather a reference volume in which you can browse through the six parts containing cumulatively 30 short chapters, themselves broken into multiple subtopics. My first impression of My New iPad 2 upon scanning through the six-page table of contents was that there's a lot more to the iPad 2 than I had imagined. While the iPad appears to be a disarmingly simple device and is relatively easy to use, at least for its basic functions, some aspects of its capabilities are less than intuitive. Indeed, my first impression of my new iPad 2, upon unboxing, was that I was really, really, really glad I had this book in hand. iTunes does a good job of walking you through the basic setup process - at least it did after I downloaded and installed iTunes 10.1.3 to replace the iTunes 8 point something I had been using on my MacBook, a system requirements point that is only mentioned in microscopic fine print on a sticker on the back of the iPad box. It's not that big a deal, but it is something that should be made clearer for those of us who keep Apple's Software Update turned off in OS X. My New iPad 2's six part categories are Basic Training; Making the Most of Your iPad; Getting on the Internet; Video, Music, Photos, and E-books; Organizing Yourself; and Additional Tips. Basic Training is just that: It explains the rudiments of iPad 2 use, such as how to turn the machine on and off, charging and power conservation, using the physical and virtual controls, controlling the iPad user interface, and using the virtual keyboard. Making the Most of Your iPad gets into more involved functions like customizing the Home screen, using Parental Controls, protecting your privacy, setting up an Internet connection, and app installs and uninstalls. Getting on the Internet carries on with pointers on browsing with Safari, using Safari bookmarks, setting up an email account, and sending and receiving email. 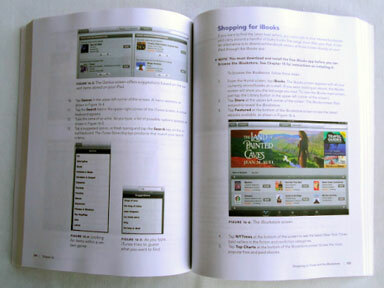 Part Four covers video, music, photos, and ebooks, explaining how to transfer songs, videos, and other content to the iPad 2; shopping at the iTunes and the iBook stores; listening to music and other audio files; watching video; reading ebooks; making, organizing, and viewing photos and videos; and using FaceTime. Organizing Yourself tells you how to jot down notes, keep contact information, use the calendar and maps, and search the iPad using Spotlight. Part Six, Additional Tips, includes information on making data on your iPad more accessible, using foreign languages, the author's take on the best iPad apps, and a section on troubleshooting. At 256 pages plus seven pages of index, My New iPad 2 is trade paperback sized and not a candidate for doorstop duty. It covers pretty much all the bases and then some for new iPad 2 users, while not overwhelming us with painstaking detail. With a cover price of $24.95 ($28.95 Canadian - I guess no one at No Starch Press is up to speed on the fact that the Canadian dollar has been trading in excess of the value of the greenback for pretty much all of 2011), you don't expect glossy, highly-calendared paper stock, and you don't get any, but the semi-matte stock is attractive enough and renders the many screenshot illustrations nicely in full color. Criticisms? Not many, but I have a few. The issue with needing iTunes 10.1 or later on your mothership Mac could have been helpfully covered, but it isn't, and some schematics of the controls, both hardware and software, would be helpful in the Basic Training section. However, if you're a new iPad user especially, My New iPad 2: A User's Guide represents good value that should justify its modest cost in time saved and inconvenience and/or frustration averted. It's also a great little reference for any iPad 2 user. Newbie or seasoned iPad/iOS veteran, if you have an iPad 2, this book will be a useful addition to your reference library. You can go online to read chapter 17, "Listening to Music and Other Audio Files" (PDF), the table of contents, and the index. It is also available as an ebook for $19.95. Author Wallace Wang is the author of several best-selling computer books, including My New Mac, My New iPhone, and Steal This Computer Book (all No Starch Press). He is also a successful standup comic who has appeared on A&E's Evening at the Improv and performs regularly at the Riviera Comedy Club in Las Vegas, Nevada. Available in bookstores, directly from No Starch Press, as a $19.99 ebook from Apple, and through Amazon.com ($13.29 for the printed version, $9.99 for the Kindle edition).